My Eldest just turned four. Before I had children I never really considered how important birthdays are to the parents, but now I couldn’t help but reflect on what have happened these four years, how sweet and adorable he was as a baby and toddler, and what a special little person he is today. I wonder what kind of man he will grow up to be, and hope I can guide and inspire him to always strive to be his best self. Last week he had his first ever birthday party for others than family members, and a handful of children were invited. Having seen it on Peppa Pig (a huge favourite with both boys at the moment), he wanted a fancy dress party. 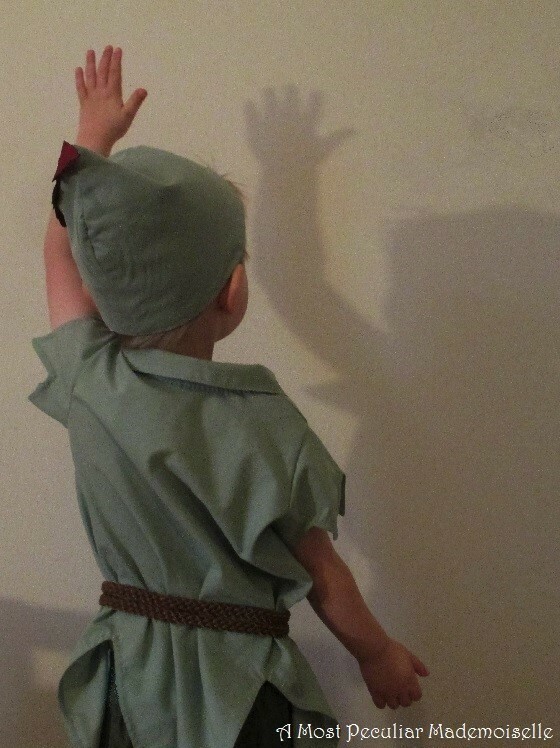 He wished to dress as Peter Pan, and who am I to refuse a request on a costume? I wanted to work from my stash, but had very little green fabric there. 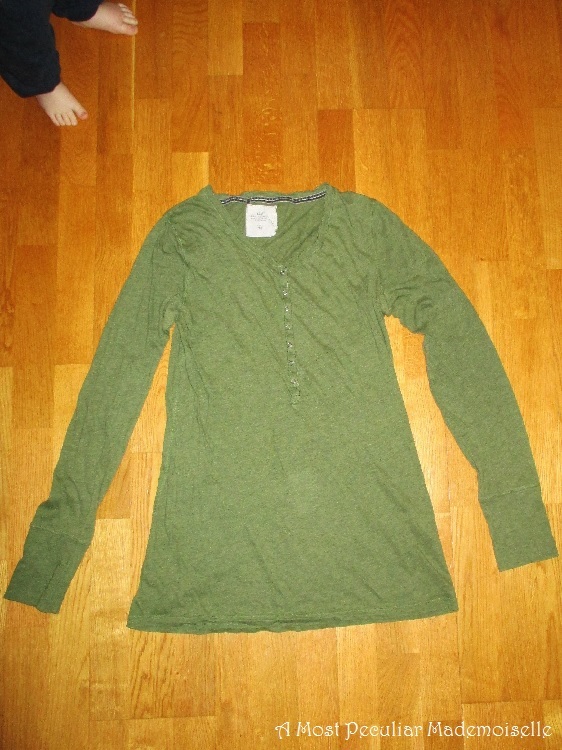 After considering for a bit I realised I had a green worn out knit top that had seen a lot of wear the past four years, as it provided easy access for breastfeeding babies. 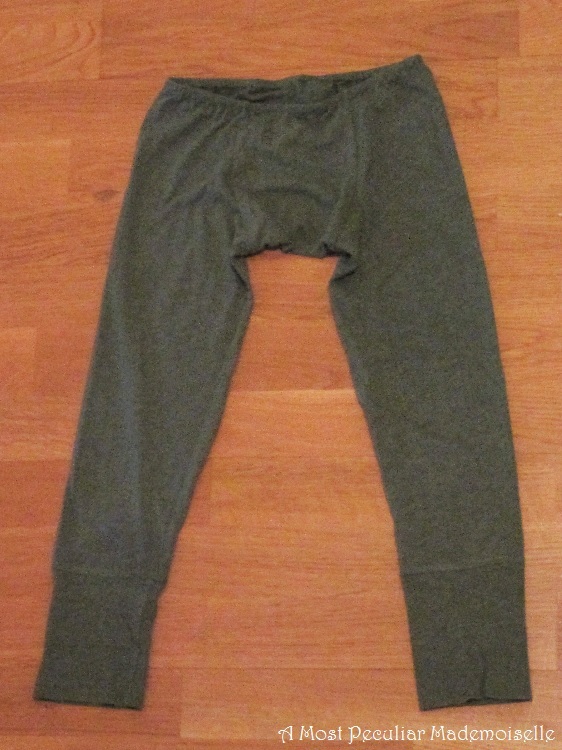 I cut off the sleeves and turned them into trouser legs, with a gusset between them. In the end they reminded me a little of the Thorsbjerg trousers, but without feet. 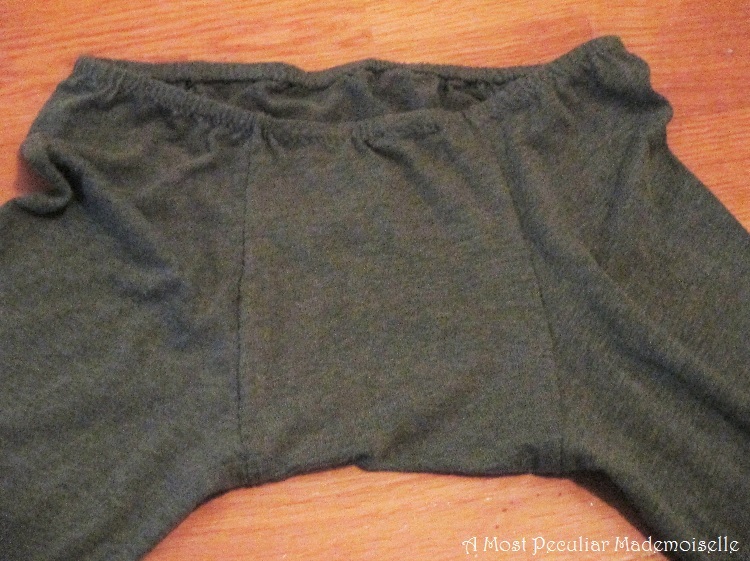 They are held up by an elastic at the waist. For the tunic and cap I recycled an old cotton blend half circle skirt. The whole outfit was made with the measure-and-cut method, using one of Eldest’s t-shirts as a cutting guide for the tunic. 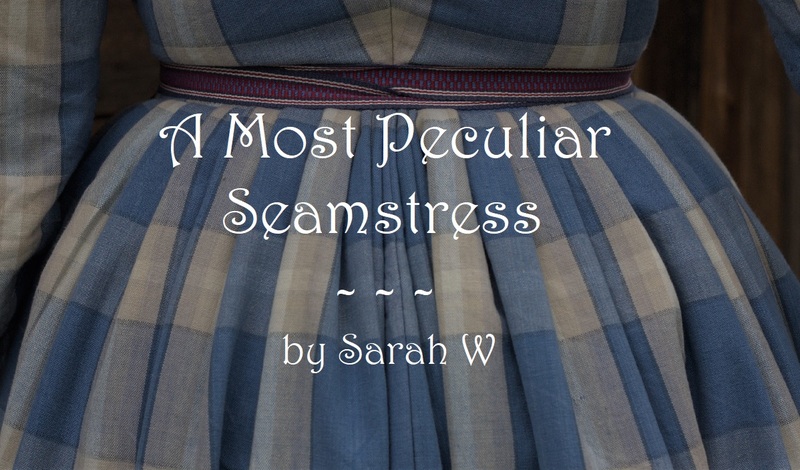 As my sewing machine seem to have given up on life, I had to stitch the cap and tunic by hand, something I’ve been trying to stop doing, except with historical clothing. 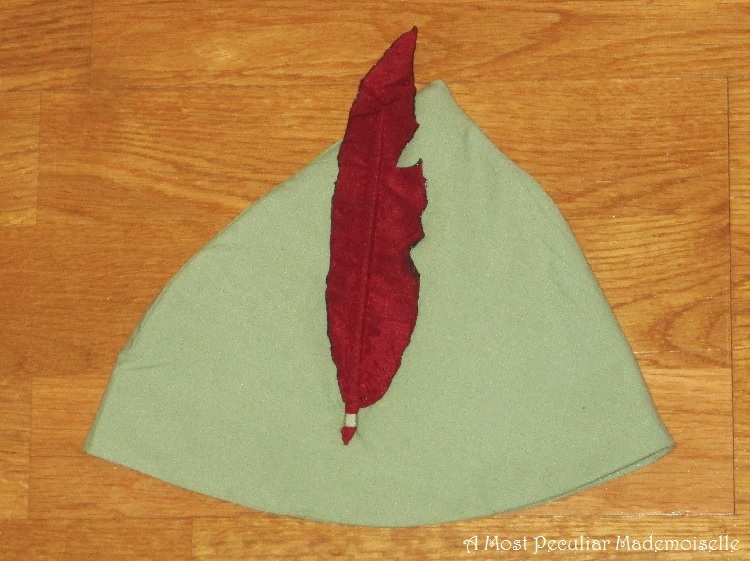 The cap is self-fabric lined for a bit of body. It has a “feather” made from some polyester-y fabric scraps, remains from when I made cushion covers a few years back. It’s stiffened with a piece of zip tie, and the edges of the two layers of fabric was then molten together over a candle. It makes a much more play friendly and endurable feather than a real one would have been, plus I already had the materials for it. The cap sits so well on the head that my boy can hold his head upside down without it falling off. 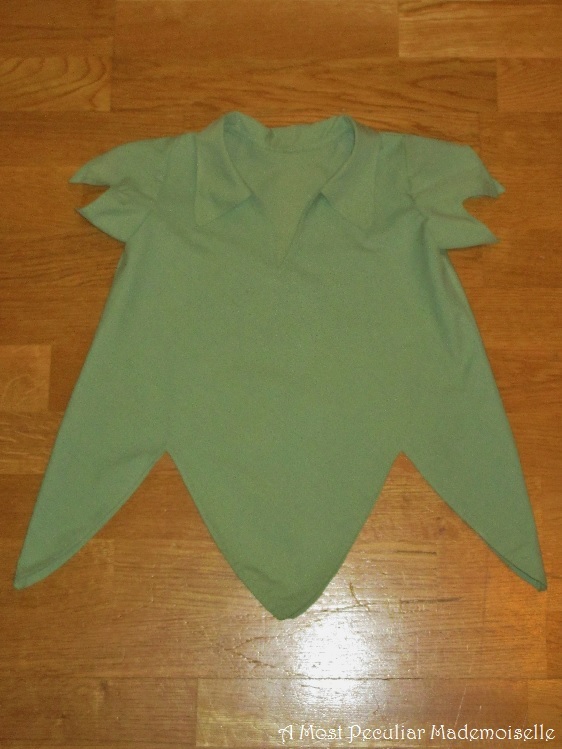 The tunic is cut on the bias, with pointed edges on both hem and sleeves. The collar is pretty standard, being made from two layers of fabric, and then top stitched. 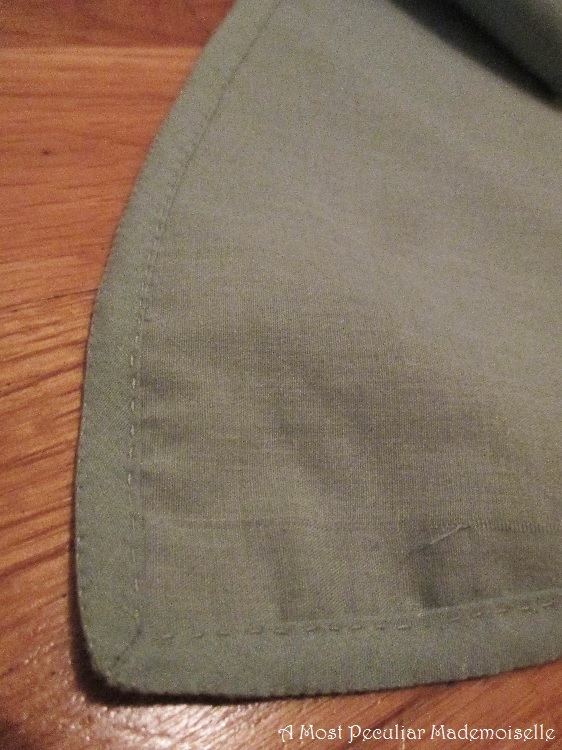 All the edges of the tunic were faced with narrow self-fabric bias tape, and all seam allowances folded in on themselves and neatly whip stitched. 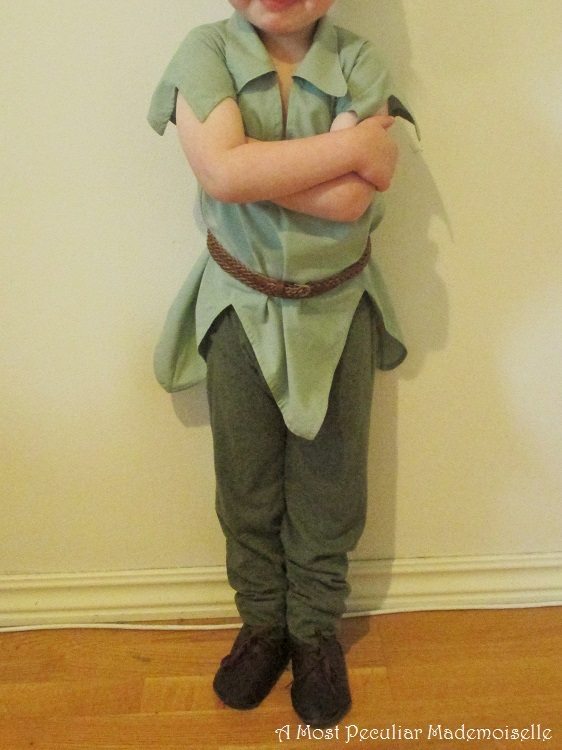 When the costume was finished and it was time to try it on, Eldest said that he needed a belt, like Peter Pan has. I didn’t have one short enough for him, but a thin braided belt wrapped twice around his waist worked well. For the pictures he also wore his medieval shoes – they are already on the small side, he’ll need new ones next year. The costume on the other hand is a bit too large, so he can use it for a long time. He was really happy with how the costume came out (though pretending to be angry in the above picture), and I couldn’t have been given greater praise than his happy and excited face when he tried it on. Adorable! I particularly like the feather. It looks quite real and does sound very durable for active childs play. I love it! Happy birthday to your dear boy! I am so impressed with how you can make such amazing things out of repurposing other things. The feather is just brilliant. “The days are long, but the years are short,” someone once said to me about my children, and it is very true. Mine will both be in high school next year — it seems like only yesterday they were turning four, too!